Source: CICH graphic created using data adapted from the Canadian Community Health Survey, 2009-2010. 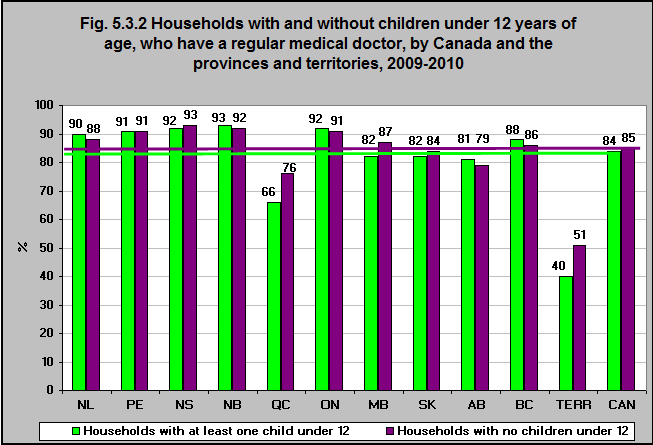 Approximately 84% of households in Canada with at least one child under the age of 12 years and 85% of households with no children under the age of 12 years reported having a regular medical doctor in 2009/10. Variation was found across jurisdictions; however differences between households with and without children under 12 years of age were modest, with the exception of Québec (66% versus 76%) and the territories (40% vs 51%). Nurses are often the first point of primary care, which likely explains the lower rates found in the Territories.